Home › Latest News › FAT BOB® 114 ANNOUNCED AS CRUISER OF THE YEAR! FAT BOB® 114 ANNOUNCED AS CRUISER OF THE YEAR! Bikesales kicked off the 2018 BOTY by announcing the Harley-Davidson® Fat Bob® 114 as their cruiser winner. Bikesales rode all the new Softails in the sweeping hills above Los Angeles, with Harley-Davidson describing the Fat Bob as a bike that “encapsulates all that is great about the new platform” – which includes the updated Milwaukee-Eight engine (the Fat Bob comes with the 114 option), better suspension and lighter and stiffer steel tubular frames. The H-D critique of the Fat Bob was spot on. With a steering angle of 28 degrees, the sharpest of the new Softails, a 1615mm wheelbase, bum stop seat, dual disc brakes, mid-mount footpegs, 43mm cartridge-style upside-down forks, two-into-one upswept exhaust, flat handlebar, 16-inch tyres and a more aggressive ergonomic triangle than its colleagues, the Fat Bob is a tactile, dynamic package – and when you add the excellent 114 Milwaukee-Eight engine into the mix it really is a winner. It’s not the lightest of the new brigade at 296kg, but the Fat Bob 114 is the agility and corner king. 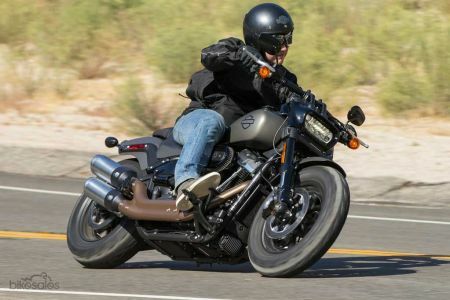 With the rider firmly wedged into place for some spirited action, there’s plenty of lean angle and ground clearance, and the weight transfer through those footpegs is quite pronounced. GET YOUR HANDS ON A 2018 FAT BOB NOW BY CONTACTING US BELOW!